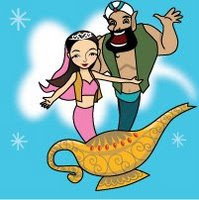 I am very happy for the return of the Genie Princess and Genie King. It is also an honor that they visited my humble abode bringing their magical lamp. 1. Add your site(s) to the list once you have received the Magic Lamp of Luck. 2. Pass on the Magic Lamp of Luck to as many people as you like. After all, everyone needs some good luck! 3. Leave a comment HERE once you’ve passed on the Magic Lamp of Luck. Once the Genie King and Genie Princess have visited your site to make sure your links are complete and proper, you will then be added to the Master List. 4. To ensure everyone receives equal link benefit, please UPDATE your list regularly! I am tagging Sheng, Tess, Nova, Jenn, Lizzie and Ivy.